Loud is loud, and The Carmichael Show certainly is that. Funny is funny, too. And here’s a fractious family sitcom with lots going for it as a throwback to the likes of Sanford and Son, The Jeffersons and Good Times. Not much was expected going in. 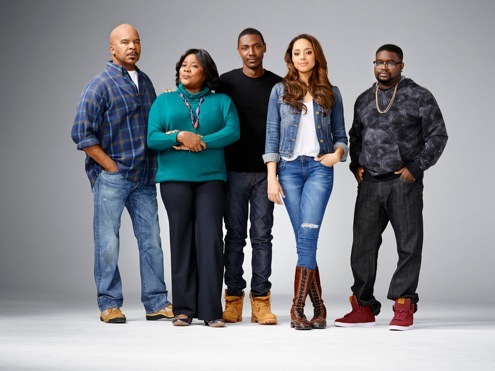 NBC seemingly is burning off The Carmichael Show -- as it did with Mr. Robinson -- by airing back-to-back episodes for three consecutive Wednesdays before the so-called “regular season” kicks in. Both comedies are propelled by black male stars. But Mr. Robinson landed its jokes with a series of big thuds while The Carmichael Family is much smoother, even in the face of decibel levels that threaten to shatter the sound barrier whenever Momma and Daddy are spouting their decidedly old-school values. The show’s quieter presence is North Carolina-bred comedian Jerrod Carmichael as Jerrod Carmichael. His “therapist in training” girlfriend, Maxine (a well-tuned Amber Stevens West), has recently moved in with him. But Jerrod very much wants to keep this a secret from his parents, Joe and Cynthia (David Alan Grier, Loretta Devine). That’s because he knows they’ll go all crazy on him. Not that they wouldn’t anyway. Dad, a truck driver and triple bypass survivor, is first seen eating ribs with nacho cheese dipping sauce while wearing a “Neo-Bama” t shirt. His wife, a devout Bible believer, is also Joe’s enabler. Her cooking could clog the Hoover Dam and she still preaches the virtues of Paula Deen’s biscuits (in the third of three episodes sent for review). An even-tempered but opinionated son beset by rigid parents is an eternal sitcom trope. But if the trope fits . . . Somehow it does with The Carmichael Show, which can be laugh-out-loud funny because its cast knows just what to do with some pretty sharp material. But Joe says he once voted for George W. Bush because his administration sent him a $1,600 stimulus check. No, his vote can’t be bought. But yes, “it can be stimulated.” Grier knows how to deliver such lines after a long career in TV comedy that first took hold with In Living Color. Devine’s a seasoned pro, too, selling her shrill bursts with complete conviction. There’s also a less than cerebral older brother named Bobby (Lil Rel Howery), who hasn’t yet told his parents he’s divorced. Jerrod uses this information as last-ditch leverage in hope’s of thwarting Maxine’s insistence that they come clean with Joe and Cynthia. In Wednesday’s first episode, it all plays out without ever petering out. Episode 2 is built around protests in Charlotte over a police shooting of an unarmed young black man. It also happens to be Jerrod’s birthday. Maxine, wearing a “Black Lives Matter” t shirt, finds a surprisingly willing protest partner in Cynthia while Jerrod just wants to enjoy his birthday in peace and Joe is matter-of-factly indifferent. The pros and cons keep piling up, with Jerrod caught in the middle. It’s a fairly daring, message-sending episode, with perhaps something to offend just about everyone. A certain other comedy series with a Bunker mentality used to do much the same. And they were loud about it, too. The Carmichael Show won’t win any prizes for originality. It does, however, play very well with the above-average material it has. That’s in no small part due to the well-blended cast. Jerrod Carmichael seems comfy in the sitcom realm as a lower-keyed son with occasional flareups. Amber Stevens West is instantly appealing in a reactive/assertive role while David Alan Grier and Loretta Devine turn up the heat without scalding everything. It all makes for a pleasant surprise in one of television’s longstanding nowhere lands between the end of summer and the start of all that fall season “excitement.” In that context, NBC is tossing on a show that really shouldn’t be tossed out after its six episodes quickly come and go.